It’s almost time for back to homeschool! I love when all the sales roll around. My heart is happy when I stock up on pencils, papers, art supplies, and new binders. Nothing gets me as excited for a new school year as walking through the aisles and choosing our new supplies. I love the feeling of a fresh start and a new school year. Are you excited for back to homeschool? 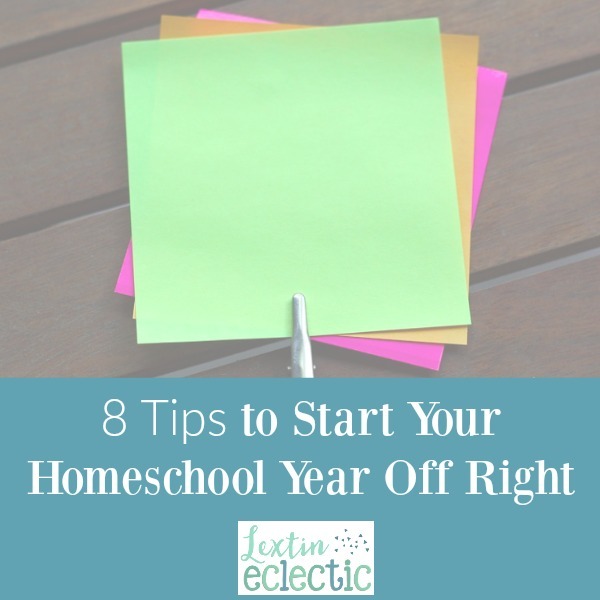 Well, whether you live for back to school sales or whether you’re dreading another school year, I have some great tips to help you start your new homeschool year off right. Over the past 6 years of homeschooling, I’ve learned a few secrets that have helped us successfully launch each new school year. These have been my go-to tips for homeschooling. I call them my homeschool action plan! If you need a new action plan, be sure and download my free workbook to help you plan your new homeschool year. Ready? Here are my top 8 tips for starting your year off right! Take time to sit down and think about your family rules. Make sure they are simple – easy to remember and easy to enforce. I recommend writing down no more than 5 rules. And make sure you also include a consequence for each rule so you’re not trying to think of an appropriate consequence in the moment. For some inspiration, you can see our list of family rules in this post. Decide which chores would be appropriate for each of your children. Then, take a week to train your kids on several chores and create a list of chores for each child. Post that chore list in a place where everyone can see it to be reminded of his or her responsibilities. I’ve learned that I cannot keep up with everything during the school year and that our family has to work together as a team to keep the household running smoothly. I don’t know about you, but in the past few years I’ve had some very grouchy students. They complain every school morning. They question all assignments and gripe whenever they need to complete some work independently. Other times I’ve been the one with the terrible attitude. I’ve started my homeschool day with a frown and been short and crabby with my kids. I’ve realized that we need to make a homeschool agreement. In this contract, my kids agree to do the work I assign without arguing and complaining (lest they receive additional work or chores), and I agree to teach them with patience and a smile. Of course, we all fail at times, but it helps us stay more accountable when we know that we’re all in this homeschool thing together. One of the best things I have done for our homeschool is to set our school hours. We have both a start and end time for our day. Not every day is quite perfect, but in general, we try to stay with the schedule. My kids know what to expect each day and they also know that when the day ends, they have several hours to pursue their own interests. And I can be more positive and patient during the homeschool day knowing that I have a scheduled break in the afternoon. Setting parameters for our day has made everyone happier and we enjoy knowing that we have some free time each afternoon. I know many people will discourage you from creating a schedule, but I think they are vitally important. At the start of each school year I write out a schedule in 30 minute increments. This helps me see how everything will fit into our school day. It also shows me if I have any unreasonable expectations for our schedule. Many times I’ve cut back in certain areas or rearranged our day when I say that my plans would not actually work on paper. Having a schedule keeps me from over planning our day and helps me make sure I have a balanced amount of time with each child. My kids do better when they know the order of our day and when we do each subject. My little kids love knowing that they have a special time on our schedule just for them. I also have a routine for housework. Laundry is started at breakfast, put in the dryer at lunch, and put away right before dinner. Dishes are unloaded at breakfast, reloaded and run at lunchtime, and unloaded and reloaded at dinner. By breaking up my responsibilities into smaller more manageable chunks throughout the day, I’m able to accomplish more without feeling as overwhelmed. Before you begin a new school year, have a plan in place to take care of you. Plan certain days off of school to take field trips or simply go to a park or even to have a relaxing movie day. Choose a few weeks that you will take off of school in order to have a short break. Find a time to exercise and pursue some of your own interests. Schedule some dinners or coffee dates with other friends. Don’t cram your schedule so full that you don’t have time to do the things you enjoy. And don’t feel guilty for enjoying some time to yourself. I’ve let my kids watch movies for an entire day while I listened to encouraging podcasts and read some books. I put these days on the calendar as teacher-in-service days. These are days for me to refresh and recharge during the year. A few years ago I eased into our new school year because we had a newborn in the house. It was such a wonderful experience to have a soft start that I’ve done it every year since. I start with only one or two subjects for the first week of our homeschool and then gradually add more subjects throughout the first month. This helps us ease into our schedule and routine, allowing me time to make any changes or tweaks as I see how our year is going. I think you’ll find all of these tips invaluable in your homeschool. What do you think? Are you ready to begin a new year? When I have my plan in place and have implemented all of these ideas, I have a balanced and successful homeschool year. When I forget any part of the equation I struggle – and my kids do too. I have found that when I have everything written down, printed out, and posted throughout the house I am able to stay on track. I also prevent this really horrible thing called decision fatigue. Stop and think about the number of decisions you make on a daily basis. If you’re like me, it’s a big, big number! Well, because you are making lots of decisions every day you can become tired and frustrated and reach a point of fatigue. Basically, you become unable to make any more decisions. When you have a written plan in place you eliminate many of the last minute decisions and your day can flow more smoothly. Planning for your homeschool year is more that just choosing curriculum. You need to spend time creating a plan that encompasses a schedule, a routine, household chores, and self care. So, get your plan in place and be prepared to start your year off right! Don’t miss the other posts in my homeschool business plan series. They’ll help you plan a great start to your new school year! I love the idea of school hours too. Knowing that at a certain time each day school will be over even if all the things didn’t get done, is a stress reducer for me. Yes it is! It’s a relief to know that on the difficult days there is an end time and a break to look forward to. And my kids really appreciate knowing that they will have time to pursue their own interests – they need something to look forward to as well. I love that so many of these are about more than just homeschooling because you’re so right, we have to have routine for ourselves and our house if homeschooling is going to go over well. I’m going to work on our routine schedule today! I bookmarked this post to reference back to. Thanks for sharing!!! You’re welcome! I think having consistent routines are the key to getting more done in homeschooling and in home-making. It has helped me stay accountable. I LOVE the idea of a soft start! This will be the first full year of homeschooling for me and my little guys and a soft start will help to make it smooth beginning to a wonderful year! Wonderful tips. Passing them on too! I’m glad it was helpful! Having a soft start has been absolutely amazing in my homeschool. It takes several weeks to get things up and running smoothly. And yes, I also think schedules are vital! So fun! Im starting to homeschool my daughter for preschool so this was a great post with lots of tips I will have to try! Thanks!! Having a chore week has been one of the best things I have done! Now my kids can help around the house and they are learning life skills. Great tips! We are starting our first year of homeschool this year and I’m excited!